Men's leather trousers Aron short of Stockerpoint in speckled-yellow bison. The leather trousers made of high-quality, tanned buckskin leather in deer look is characterised by the unusual vintage look. The embroidery according to old models is harmoniously tuned and the special finishing gives it the unmistakable "used look". The extraordinary structuring of the leather with antique colour gradients give the model a unique touch. Thanks to the lacing on the back of the waistband and the colour-matching yellow band on the hem, the leather trousers can be adjusted in width. The trousers will be delivered with belt. Typical is the replaceable clasp in antique silver. Nur zur Info: Ich bin weder ein Roboter noch ein Insider. 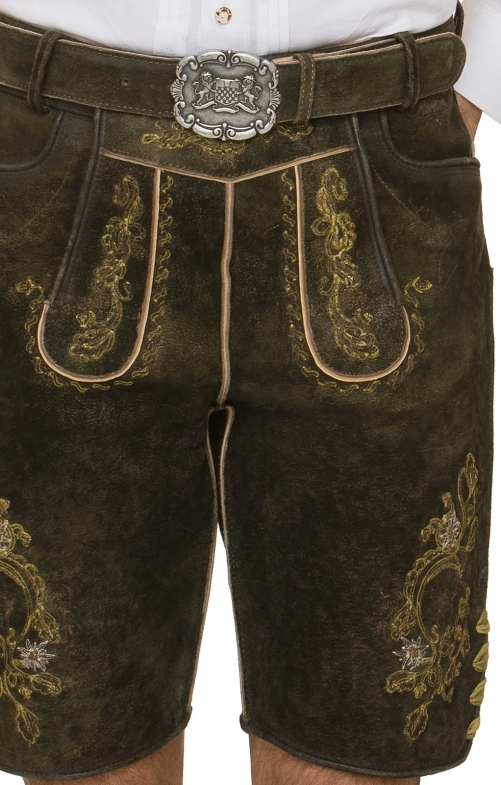 Nur ein kritischer Kunde mit einer Mehrzahl von Lederhosen und einer Vielzahl von Lebensjahren.